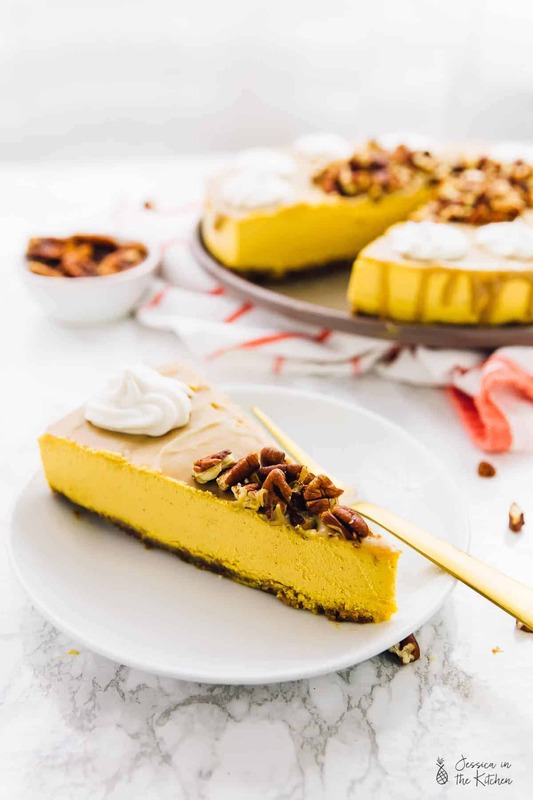 This Vegan Pumpkin Cheesecake with Salted Caramel Topping is a complete showstopper dessert! It’s incredibly creamy, thick and has such a delicious flavour! I’ve already had DOZENS of rave reviews – you need to make this! This post is sponsored by the Calphalon brand. All opinions and text are 100% mine. Thank you for supporting the brands that support Jessica in the Kitchen! So here’s my deal – I love vegan desserts. Muffins, cakes, mousses – love them all. Then there’s vegan cheesecake. Sometimes I love them, but sometimes I’m ashamed they are even called cheesecakes in the first place. To me cheesecake means thick, creamy, and doesn’t melt in ten minutes. In fact – it shouldn’t melt in 30 minutes or even 45 minutes! I set to making this my mission and FRIENDS – it’s here. 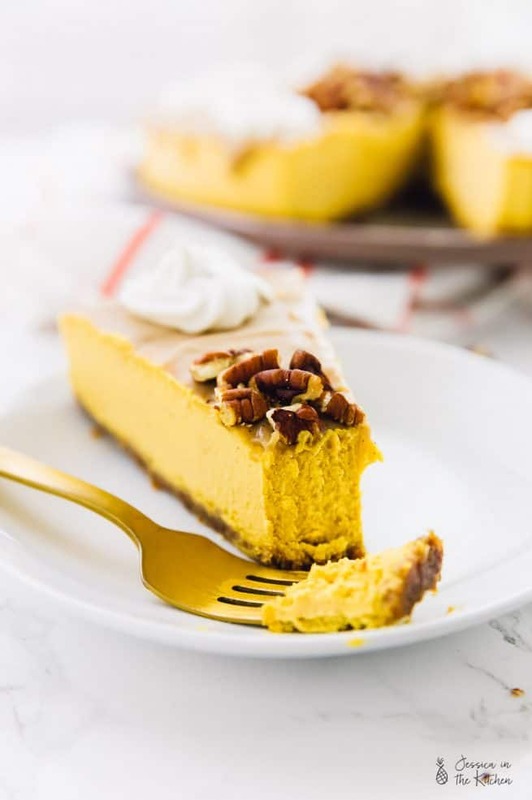 This Vegan Pumpkin Cheesecake with Caramel Topping is THE fall cheesecake. We tested this several times and it stayed thick for up to an HOUR. Oh, and it also tastes so divine that you’ll be begging friends to make it for you. Let’s get into it. 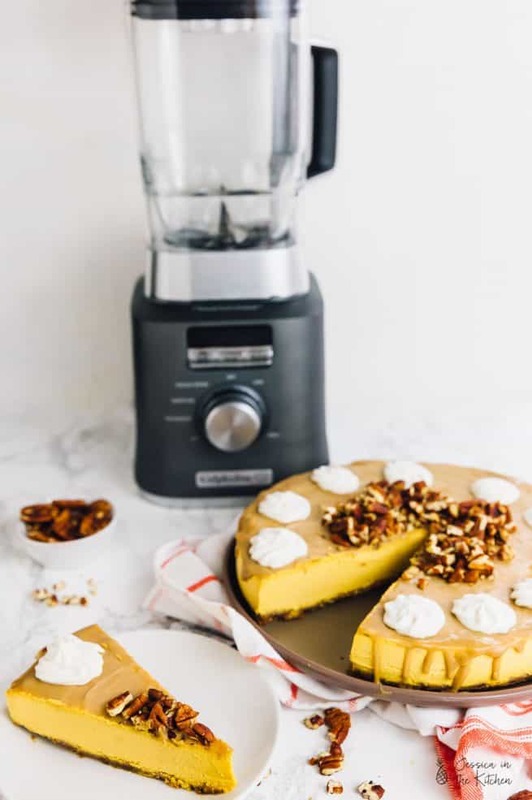 First things first, you need an amazing machine to make your vegan cheesecake. One that powerfully blends your cashews, pumpkin and all the in betweens so beautifully together. There’s an app(liance) for that! Yes, I’ve been waiting to use that line. I used Calphalon’s brand new Auto-Speed Blender to make this beauty! If you watched my Instagram stories then you saw just how beautifully it blended the filling for my cheesecake together. It’s quieter than most high speed blenders which I love, and SO easy to clean. Honestly, Calphalon definitely went out of their way to create easy to clean products for their new Appliances line. No crevices or difficult materials. It’s a food blogger’s dream come true! I would highly recommend this for the holidays and beyond, and definitely also as a gift because they’re so beautiful and functional! Speaking of new Calphalon products, the brand just released a full line of kitchen appliances. This beautiful collection includes the Calphalon Quartz Heat Countertop Oven, the Calphalon Special Brew Coffee Maker, the Calphalon Even Sear Multi-Grill, the Calphalon Digital Sauté Slow Cooker, the Calphalon Intellicrisp™ Waffle Maker and the Calphalon Auto-Speed Blender. 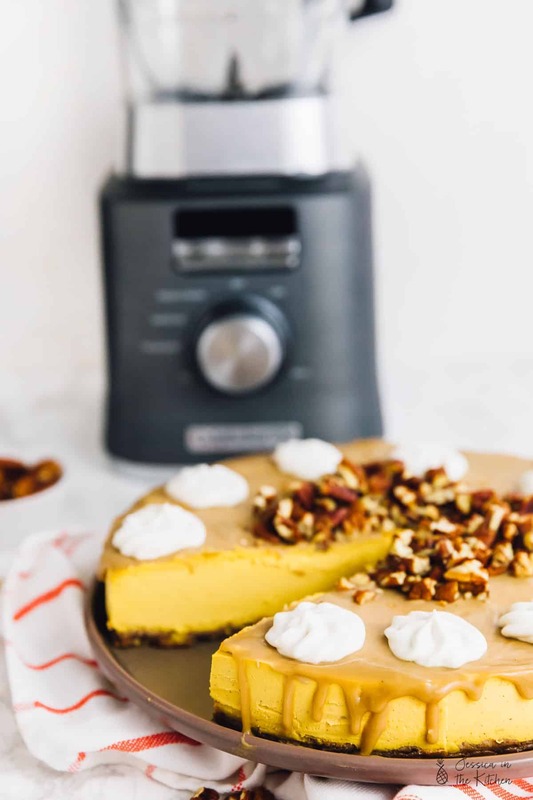 Thanks to the ease of the Auto-Speed Blender, this vegan pumpkin cheesecake comes together in under 30 minutes, which is insane. Then you let the freezer do the rest. I recommend freezing it overnight. That really sets it up beautifully. Then just let it thaw for like 15-20 minutes before diving in. You’ll be met with a pumpkin cheesecake flavor you’ll definitely what to make again and again. The filling goes so well and smooth against the base layer of dates and nuts, and is suitable for someone who is gluten free too! P.S. 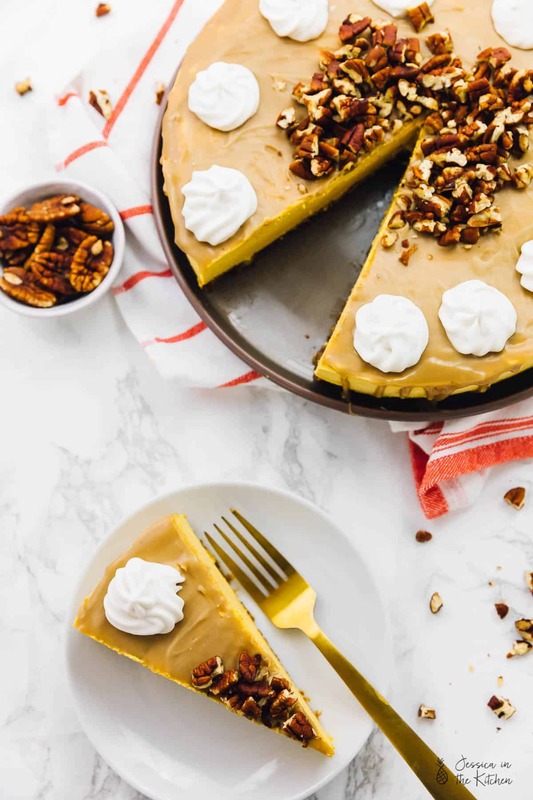 I topped this Vegan Pumpkin Cheesecake with my Salted Caramel Sauce link here and coconut whipped cream! Dig in and enjoy friends! I know this will make it to your Thanksgiving table! UPDATE: This cheesecake has since been shared with dozens of people who have absolutely raved about the flavours!! I guarantee, vegan or not, you’ll love this!! Blend the nuts in your Calphalon Auto-Speed Blender until it starts to turn into a meal consistency. Add the warm dates and pulse until blended together, scraping down with a spatula every now and then. The dates and nuts should mix together and be slightly sticky. Press into the bottom of your parchment paper lined cheesecake pan (I used a 10” inch). 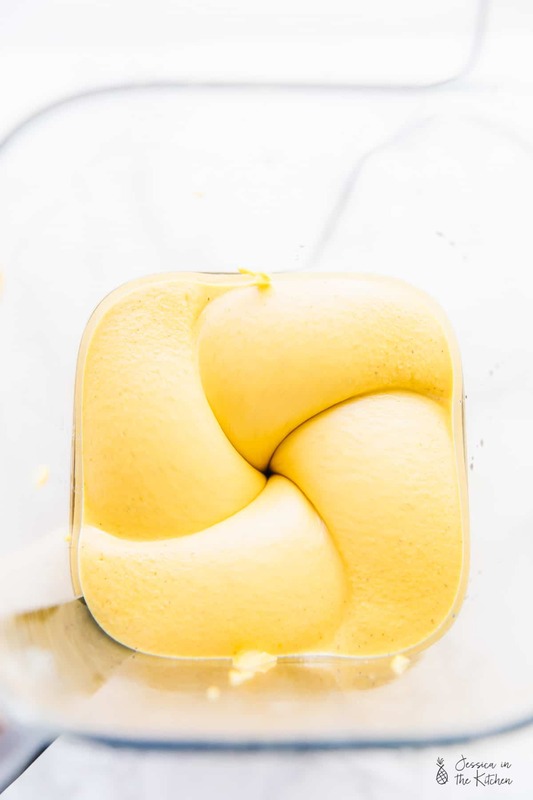 Place in the freezer while you make the filling. 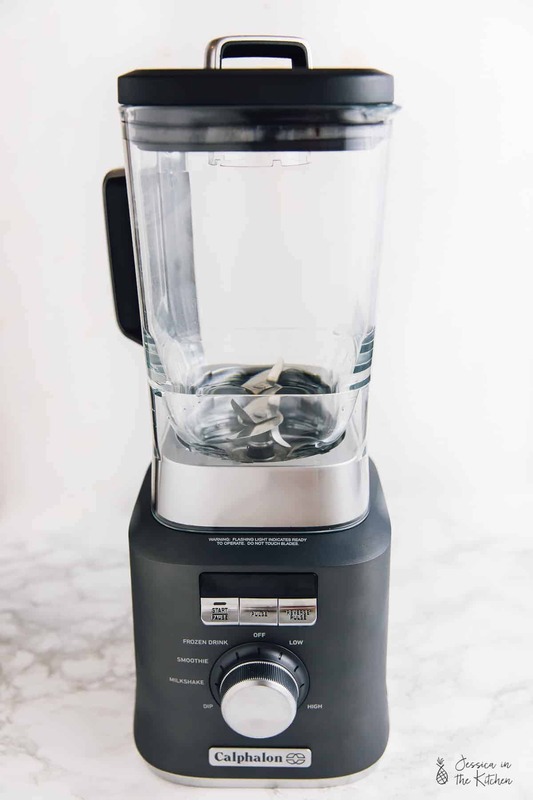 Mix all the filling ingredients together in your Calphalon Auto-Speed Blender and blend for about 4 minutes or more, until smooth and creamy. Remove and use spatula to scrape down anything that wasn't blended. Blend again for one minute or until the cheesecake is smooth (not grainy at all). Pour filling over crust and smooth down. I used a 10” inch cheesecake pan. This recipe should also work for a 9” inch or 8” inch, you just may have some excess batter that you can put in ramekins. If using a 7” inch or less, cut the recipe in half or use the excess in ramekins. Remove from freezer and allow to thaw for about 15 to 20 minutes. Enjoy! This recipes makes a LARGE 10” inch cheesecake. This recipe should also work for a 9” inch or 8” inch, you just may have some excess batter that you can put in ramekins. If using a 7” inch or less, cut the recipe in half or use the excess in ramekins. Refrigerate two cans of coconut milk overnight. After being refrigerated overnight, turn the can upside down and and pour out the liquid on top. Then scoop the thick solids of the coconut milk out of the jar. You can set the little liquid (the coconut water) that’s left back in the fridge or drink it. When using your coconut cream, you want to use only the parts that thickened up – NOT the coconut water. Any coconut water will contribute to the icing of the cheesecake, which you don’t want any here! That was a delectable, healthy rich Vegan Pumpkin Cheesecake. Very appetizing. New to being a vegan. I love your site. Thank you. Thank you so much Jean Ann!! Aww I’m sooo happy to hear that!! how do you make the salted Caramel topping? This came out so delicious. So excited to find a vegan version to make that tastes so good. Even my non vegan co workers enjoyed every bite. This is now part of our Thanksgiving Holiday meal.